Why I Believe You Need a CRM Strategy, and How to Create One – Resolv Inc.
CRM strategy defines the core belief system of your organization, and details the use and adoption of a CRM system and CRM practices. As I said in my last blog post, the ultimate goal is for CRM to be the company culture related to customers and prospects. · Do we trust the data in the system? · Is the data in this system a duplication of data in another system? Is that duplication an manual process? · What does the data tell us about our customers? · Is this information useful to our customers? · Is this information that would be useful in our CRM system? · What is good about the system? · What is bad about the system? · What is missing from the system? We also review the data contained in each system with a plan for migration and integration. In this step, review all departments interact with your customers, either directly (sales) or indirectly (shipping). Start listing what role the department plays in consuming, gathering, enhancing, and updating of information related to the customer. · What is each person’s agenda? · Whose input is critical to this strategy? · Who best knows the internal workings of the department? · Who are critical to the success of the project? · Who may inhibit the success of the project? Begin planning on an individual basis how each person will affect the success of your CRM strategy. Remember, your company is not a building or a website, it is a group of people, each with their own unique personality and agenda. Therefore; don’t skip this step! Your CRM system will interface with the people in your organization. Understanding your people will help you to more successfully create the proper interface. This naturally follows departments and people. This is where you start listing the processes that make up your interactions with your customers. It is not the time to change the processes, as that is usually done as part of a new software implementation process. However, if you implemented a CRM system and didn’t change any processes as a result, now would be the time to do it. If you don’t change the process after implementing a new system, your users will develop their own process. To start listing the key processes, take a look at each department and describe the three most important functions of the department. Once you have the three most important functions, list up to three processes for each function that may need to be reviewed and modified with the implementation of a CRM system. Typically, before an enterprise CRM system is in place, data is everywhere; therefore, the process usually includes searching for and updating data in multiple places. After implementing CRM, most users have a single source for viewing and changing data. The complex process that users were used to previously changes dramatically, and as I said, if we don’t design the new process during the implementation, the users will by default. This is the time to appraise the current hardware at your organization and make note of any anticipated hardware changes. This is everything from servers to laptops and handheld devices. It doesn’t pay to have handheld devices in your strategy if you currently do not have any, and have no plans to implement them. · What data is critical to your users and when? · Are your users on the road a lot (or frequently away from their desk)? · Are your users remote workers? · What is internet connectivity like for your users inside and outside of your facilities? · What devices are available, and what are we planning to make available? Let’s face it, one reason for CRM is reporting. Management wants to know what is going on. Whether it’s a better understanding of the sales funnel, or a review of the stability of the company based on the customer base, reporting is a key element. Don’t forget to include critical reports in your strategy. This is especially important if you are switching CRM systems, or eliminating a data source that may contain reporting vital to management. Next, review the sales goals of your organization. What are your goals for the next 3 to 5 years? 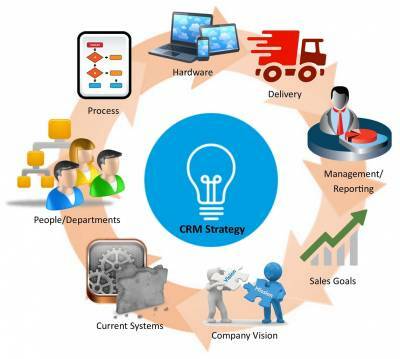 How will CRM play a part in the realization of those goals? What departments are affected by the goals? What processes would need to be changed as a result of the goals? It is critical that a CRM system is implemented in alignment with your company sales goals. A CRM system that is not implemented in alignment with a company’s sales goals often forces a user to choose between the CRM system and the stated goals. The biggest argument against a CRM strategy is that it takes too much time. My answer is, “of course it takes time, planning usually does.” However, the hours you spend planning prior to a CRM implementation will save you weeks, months, and sometimes years in achieving meaningful, measurable results. Do you have thoughts about this process? Comment! Do you want to discuss this further? Email me at lrussell@resolvcrm.com.